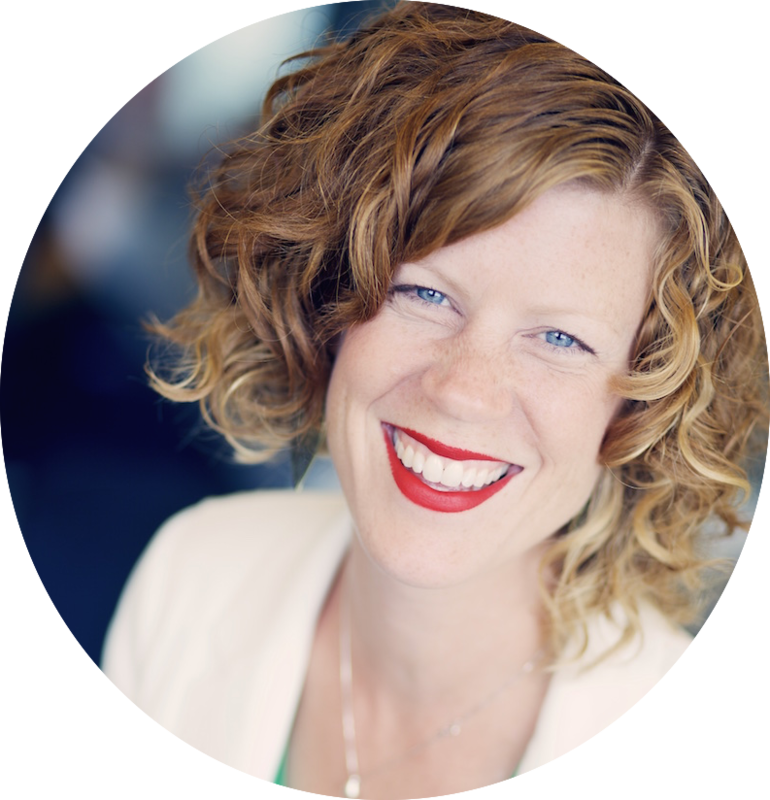 Recently, I was contacted by a client who was feeling overwhelmed. They hadn’t been able to follow everything in the programme that we had discussed and were feeling guilty about it. They hadn’t gotten into good habits and were worried that they had let me down. Feeling disappointed that they hadn’t done it perfectly. Everyone gets into this trap. People who are perfectionists get into this trap even more frequently. The higher the bar you set for yourself, the further it is to fall. So, what is the trick? How do you break this cycle? 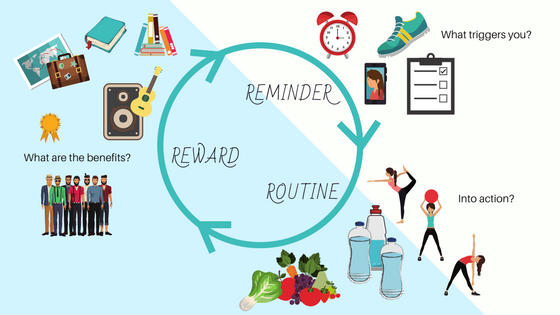 I started doing some research to add to what I already know about building habits and came across some well-written articles that include the science behind it (I love this approach!). What side do I start brushing my teeth on? ie I want to lose weight so I’m going to run every day in the park. If I repeat this activity, then a habit will be formed. I had read that you need to do something 26 times at least to make it a habit and did #100daysofgratitude on Instagram at the end of 2017 to help me through a tough time. Dean says this isn’t true and research shows that it does vary a LOT between people; don’t we all know someone who was vegetarian for a decade and then suddenly started eating meat? Or someone who worked out in the gym consistently and then dropped it? What I like about how James refers to the reward is that its the ‘benefit gained’. I feel like that’s different from the ‘reward’. The reason I say this is because with the work I do, I often hear people talking about food as a reward. When you were a child, did your mother placate you with food? To keep you quiet when you were at the bank, or shopping? Or as a reward for good behaviour? Or a punishment for bad behaviour? With so many gyms and weight loss programmes, why are we suffering with so much obesity and weight issues? There IS an emotional component to our relationship with food. So what if your reward is not a reward at all, but it feels like a punishment? I had this several years ago when I tried to implement regular exercise. It felt like a punishment. I loved to try things, but doing the same exercises over and over again felt monotonous…and I have an aversion to ‘the sameness’ so it was a punishment and impossible to maintain. Dean says the key is to try it out and tweak it until it feels right. Then set up a reward plan, testing and adjusting it too. When new clients come to me they are often apologetic about their diets. Everyone is afraid of being judged, but they are already judging themselves. I tend to encourage clients to focus on the positives and work on including what is healthy before focussing on what they need to eliminate from their diet. It’s a mind switch. So what if you are ready to start excluding the ‘bad’ stuff? What’s the best way? Taking the 3R’s, we could say that if the goal is to stop eating fried spring rolls then we need to look at their trigger. Could they stop walking past that Chinese restaurant on the way home? Is there another route? Could they include more fish in their diet so their body doesn’t crave fat? These are simple ways to help, but what do you do at a party where spring rolls are served? As I mentioned, food often has an emotional link. It’s worth exploring what that link is. Are you somehow punishing your body with unhealthy food because you don’t think you deserve to be healthy or feel good? Did something happen at work to make you feel worthless or unappreciated and you are eating this food as guilt is less painful than what occurred at work? Do you lack connection in your day to day life and this food gives you comfort (or reminds you of a period of time you felt connection)? We can remind ourselves of the statistics about heart disease or how painful our grandfather’s heart attack was to turn the reward into pain. We may realise the pain of working out or choosing vegetables over fried spring rolls is less than a heart attack, but often that is too far removed from our reality or takes too much effort to imagine or make it real enough. We are more likely to be motivated by the now, than the maybes of the future. 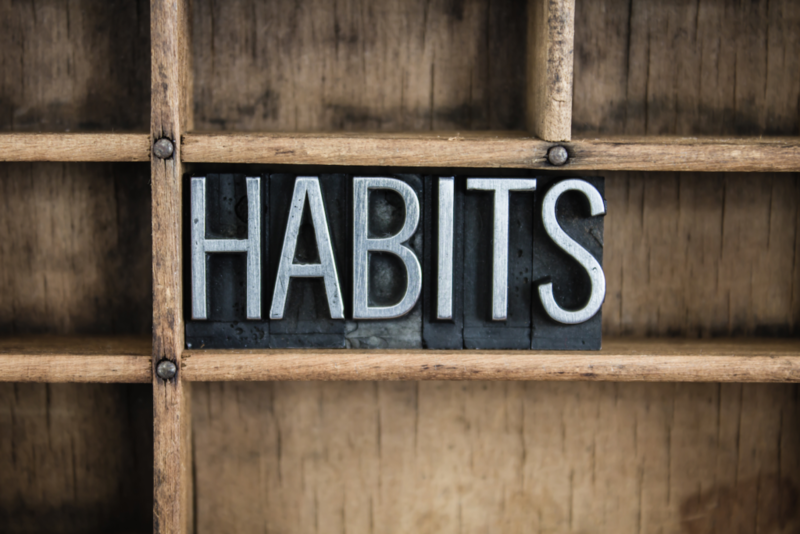 Once you’ve examined your bad habits and identified the triggers for them, you can identify new habits to link to them. If I’m bored, I tend to snack. When I realised that, I made a conscious effort to change it over to a new habit that I wanted to build. 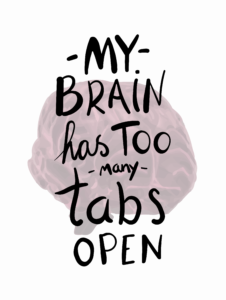 I knew my concentration was low then anyway, and I was monitoring my steps at the time and wanted to increase them. If I felt drawn to the kitchen or my desk drawer, I would instead put on my coat and walk around the neighbourhood for 10 minutes. As a reward, I felt self-satisfaction. Another reward was an increase in the steps measured on my watch. Two for the price of one! Now you know how the best habits are formed, here’s your action list. Find an accountability partner, or 5! – Who can you message to say you’re going to work out today? Who will ask you about it later or send you some words of encouragement? Will someone join you? Share a photo of your groceries with a friend. Does it help you to post photos on social media? 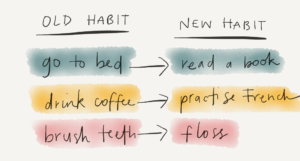 I really encourage you to check out the links above from James Clear (https://jamesclear.com/three-steps-habit-change) and Belle Beth Cooper, but especially Dean Yeong’s article (https://zenhabits.net/habitses/), which takes these concepts into further detail and gives more ideas on the subject. If you found this post useful hit like, let us know in the comments or share it around. Great article! The psychology of eating is so important, thank you for sharing such practical advice !